Absolutely, positively one of the BEST books I have read in years! This book is a paranormal romance story of Joelle Randall and Luke Gevaudan. It is by far one of the most intriguing, well written romance books I have had the pleasure to discover in quite some time. Joelle finds herself in a small town in Lovell, British Columbia. Ever since her parents went down in a plane crash 12 years ago, Joey continued to feel alone and forced herself into safe and stable relationships. Anything to avoid actually feeling for someone else. Luke is a very strange character. The town responds to him with awe and caution. Residents warn Joey of his lure he has on single women who visit and tells her tales of how women disappear with him for a year and then leave without word. Complete intrigued, Joey is forced to hold her chin up high and meet his games of dominance head on. Unlike all of the other women before her, she isn’t easily subdued by his charm and powerful allure. Unable to find a guide who will take her into the mountains, she becomes extremely desperate. It isn’t until her friend Maggie points out that Luke might be her best and last resort to finding where her parents perished. There is a strange and strong attraction between them. As always with destined characters, the thread of souls is hardly easy to reject. Luke does just that. He knows what will happen to Joey, what will happen to him if he mates with her. He does not wish to put either of them through that change, and becomes cold and implacable to their desires. Fighting her seductive attempts, she becomes frustrated and it is only a severe accident that leaves their bond open and vulnerable. Reluctantly accepting her request and promising to lead her to a place that will provide closure, there are dangers that appear out of nowhere. 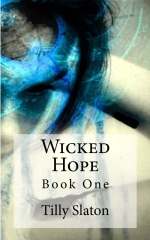 Death threatens them and panic sets in as they realize the impact if they lost one another. This book is by far one of the most outstanding romance novels I have read in quite some time. Although there is very little “action” or “fast paced adventure” in the first half (200 pages) of the book, the relationship progression does not disappoint. Usually, I would find myself suffering through a book that does not provide danger or adventure right away. That is most certainly not the case with this story. I am now reading the second book from the “present time wolf series”, Prince of Shadows and I am having to force myself to sit here and write this review when all I want to do is cop a squat and read read read! I recommend this book to anyone who wants to actually READ instead of sift through an easy reading book. The sexual content is mild to moderately descriptive and the violence is moderate as well. I do not recommend this book to children. Mature adults only! 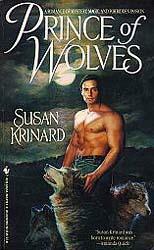 This entry was posted in Reviews and tagged paranormal romance, prince of wolves, romance, susan krinard, werewolf, wolf. Bookmark the permalink.